This two our tour is a great way to see the Indian River Lagoon. Our launch site in the marina at the Riverside Cafe is known for its dolphin and manatee sighting, really makes the tour guides job easy. That way they can focus on teaching paddle boarding and kayaking, and being your photographer. Your tour includes a lesson, photos, bottle of water, sunscreen and a lasting memories. Sometimes you want to go off on your own, and that’s OK. We offer self guided rental options too. 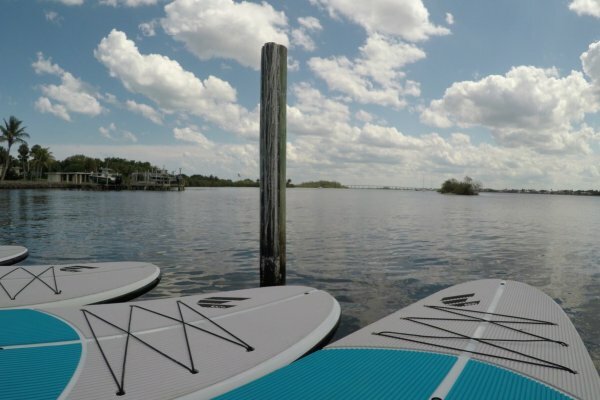 These paddle board and kayak rentals are a great way to see the Indian River Lagoon at your own pace. All rentals include a lesson, a bottle of water and sunscreen. And like the guided tours we will always give guidance on the safest routes to take based on wind and weather, but also the latest dolphin and manatee sightings too.